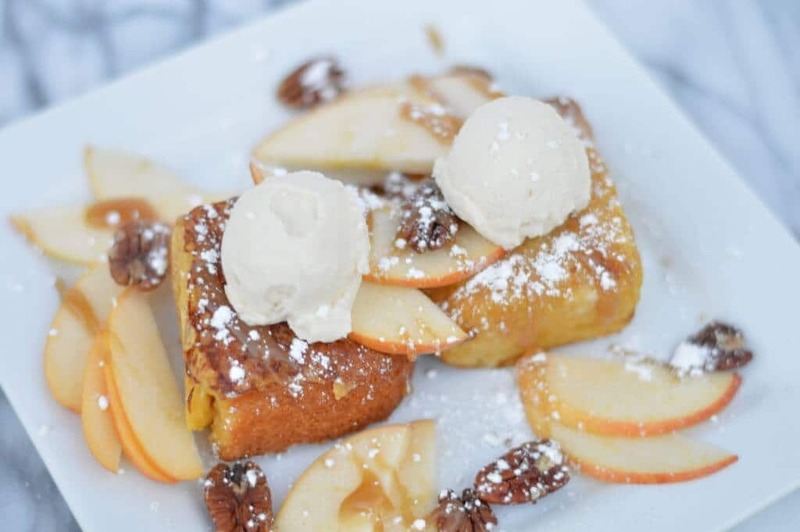 Superbly tender and flavorful cornbread battered and cooked french toast style, topped with freshly sliced apples, toasted pecans, vanilla bean mascarpone and a caramel drizzle. Have you ever fallen in love with a food? Gone to a restaurant multiple times with the intentions of ordering something different and still went back to your one true love? This is how I feel about cornbread french toast. Which was also an interesting find since I had previously fallen madly in love with their “Full Monty”, a lighter version of a Monte Cristo sandwich. The strawberry reduction sauce they serve with it for dipping…to die for. But anyway, back to the cornbread. As you may know, I’ll always choose a sweet breakfast over a savory one. Almost every time. Unless I’m having a severe craving for a toasted everything bagel with cream cheese. However, being the sweet-breakfast-aholic that I am, this cornbread french toast immediately caught my eye. Also a bonus, it had no bananas, which is on almost every other breakfast item. This beautiful plate of cornbread was piled high with freshly sliced apples, pecans, a caramel sauce, and this wonderful whipped vanilla bean mascarpone. I would eat it at least three times a week if I could. I might almost be serious. It’s that fantastic. To start my copycat off right, I grabbed our favorite boxed cornbread mix, a delicious honey cornbread mix. Fun fact: I love to bake and cook but I’ve never made cornbread from scratch. This cornbread is so moist and slightly sweet from the honey. I knew it would make a perfect base for this at-home version of a restaurant meal. A thinly sliced apple is so necessary for this dish. It keeps it from being just a warm plate of carbs 🙂 which I’m totally not opposed to, but I sometimes like to pretend that I like fruits and vegetables. Toasted pecans are up next. Toasting is totally optional and I’m not even sure they toast them at the Turning Point. I prefer toasted nuts because it really brings out their flavor. Before we get to the mascarpone, it’s definitely worth mentioning the caramel sauce. You can go the lazy girl’s route (no shame here!) but this time around I chose to make this recipe for –> homemade salted caramel sauce. It’s also pretty delicious to have over ice cream. You’re welcome. The vanilla bean mascarpone is a mixture of (hold onto your hats, people)…vanilla and mascarpone. And a dash of powdered sugar for sweetness. You can find mascarpone in the Italian section of your grocery store. I’ve heard people describe it as the “Italian cream cheese”. I don’t know exactly how it’s made, but boy oh boy is it good. Especially perched atop a warm slice of cornbread. A simple French toast batter of egg, milk and a splash of vanilla come together for the cornbread to be dipped into. 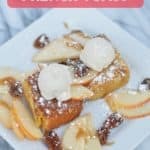 Fry the cornbread squares up to your liking, slice up an apple, scoop some vanilla bean mascarpone, sprinkle with pecans and powdered sugar and finish the whole shebang off with a generous drizzle of caramel sauce. What a great day it is to be alive. What’s your favorite brunch food? Do you make it at home or always order it when you’re out? Combine egg, vanilla, milk and sugar in a bowl. Dip both sides of a square of cornbread in the bowl of wet ingredients. Over a medium high flame, cook each side until the egg has cooked and the crust is golden brown. In a separate small bowl, combine mascarpone, vanilla and powdered sugar and stir until combined. Slice apple and sprinkle over cornbread french toast. Sprinkle pecans over french toast. Drizzle caramel sauce over the entire dish. Using a cookie scoop for that rounded shape, scoop mascarpone mixture onto cornbread french toast. Finish with a sprinkling of powdered sugar & enjoy! Still hungry? Check out my breakfast archives!! Haha, thanks Krysten!! Let me know if you decide to make it 🙂 it’s fairly simple to put together and so darn delicious. This looks amazing! I can’t wait o try it. Thanks, Cassie! It’s one of my faves. This looks so good! I would have never thought about making cornbread french toast. I can’t wait to try it! Those were my exact thoughts as I ordered it off of my favorite brunch place’s menu for the first time. “This sounds kinda weird…but also good? I’ll try it.” So glad I did! Have an awesome week, Tracy! 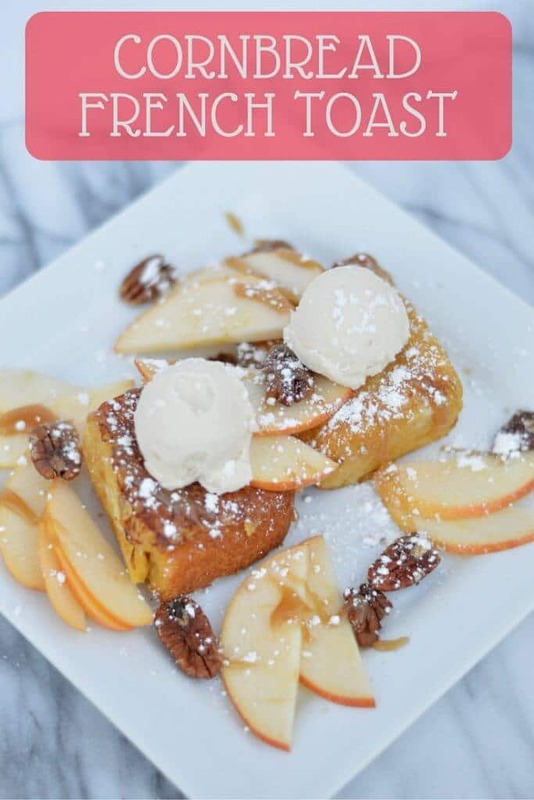 Cornbread French Toast topped with caramel and vanilla mascarpone – I’m loving the sound of it! I’d be happy with this as a breakfast or a dessert! This is so awesome! I’m already drooling just looking at the picture. Cant wait to try this tomorrow! Thanks, Shreya! It’s one of my favorite dishes to order at my favorite brunch place so I knew I had to make it on my own 🙂 have a fabulous weekend! Currently traveling but will have to try this when I get home! Also, your pictures are beautiful! Sometimes we just need a sweet breakfast and this is perfect. Love this combination! So creative and looks awesome! I never would have thought of using cornbread for french toast, but yours looks fantastic!! Thanks for sharing on the What’s for Dinner link up! Thanks so much! Thank you for hosting an awesome link up as well!! This looks ridiculously good! And this is perfect timing because I have leftover corn bread sitting on my counter right now! Meant to be? I think so! I’m a cornbread FIEND so basically this is the breakfast of my dreams. Looks delicious! I would never have thought to make french toast with cornbread. What a lovely french toast, looks delicious! OMG!!! This looks so amazing and I’m sure it tasted so good. I never have seen or tried cornbread before, but after seeing this, I wanna go home and make it. I’m bookmarking this for future use. Thank you for sharing. Yayyyy let me know how it goes!! I love delicious fate 🙂 Happy weekend, Karrie! I know! Literally nobody gets even a taste of this when I order it out – it’s all gone before they even get a chance, haha! Corn bread french toast, say what?! This sounds heavenly! I know, right?! Thanks, Cara! Wow! This looks incredible. I LOVE cornbread and never thought to use it for French toast! What an awesome idea! I love the addition of caramel and apples, too. Oh and the mascarpone to top it off sounds just heavenly! 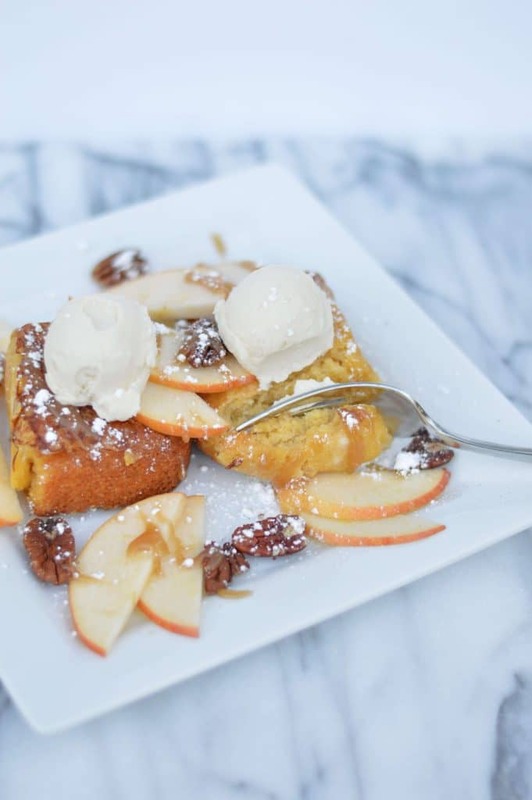 What a fun twist on french toast, I think my sister would die for this cornbread version! Thanks, Elizabeth! Let me know if she ever tries it! It’s just so darn good. Trader Joe’s is the best. I might make my own homemade cornbread – but today is not that day, lol. Have a lovely weekend, Heather! I have definitely fallen in love with food, Jess! Over and over again… Lol. This cornbread french toast most certainly looks like the stuff of instant love. 🙂 I so enjoyed reading about how you broke down your favorite dish to make your own version at home. And, I’m not afraid to say that I also drooled a little (okay, A LOT) while reading about the stages. Just, coulda come over and whip up a big batch? 😉 The cornbread, the pecans, the caramel sauce… oh wow. Pinning, of course! Thanks for the kind words and the pin 😀 have a lovely weekend, friend!! Perfect!! And yes, I happened to try this dish and I haven’t looked back since! Wow, this sounds right up my alley! Pinned and can’t wait to try it. So different, but looks so delicious! I will definitely try it soon!